If you were here last week, when I wrote about 5 reasons you should try directed drawing this year, then you will remember that this week, I will be offering you some tips to help make sure directed drawing runs smoothly for you. 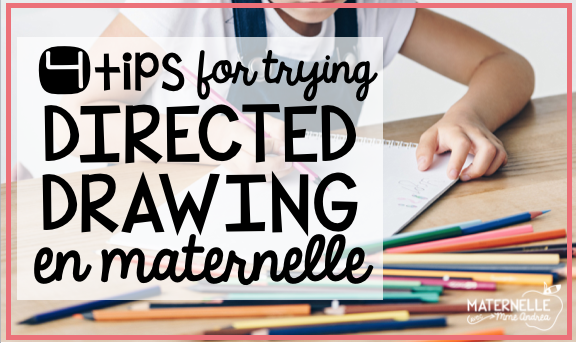 We all know that maternelle can be hectic! Directed drawing is an amazing activity if it is done well, but it doesn't always give the best results if it isn't modelled correctly first. I have been doing directed drawing for years, so I figured sharing some of my best tips wouldn't hurt! I have a lot of people tell me that they use directed drawing in centres. I do think that could work, but I am going to offer you a different idea to try first. 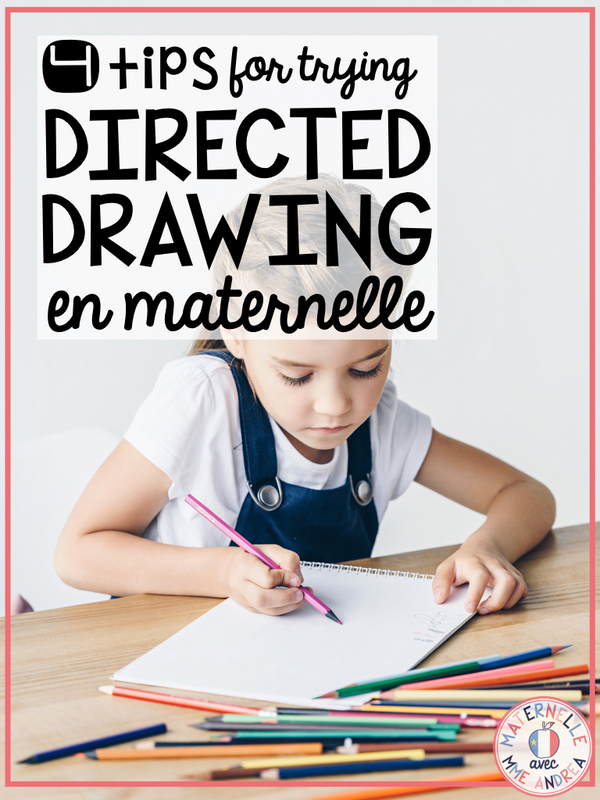 We might think that directed drawing is easy and obvious (I mean, the instructions are right there at the top of the page! ), but what is evident and easy for us is not evident and easy for someone who has never been taught. By doing directed drawing whole group first (and by first, I mean go through the whole alphabet first), you will have 26 different opportunities to model. You can model different shapes, lines, adding details, and even following the step by step directions at the top... but you can also model expectations and behaviours, and a growth mindset when you make mistakes! When you draw as a group, you can also encourage, support, and cheer on your students. It's tough to try new things, and many students believe they are bad at drawing. They need you to celebrate them! It is much harder to be a cheerleader if your students are doing directed drawing for the first time as an independent centre. You can absolutely use directed drawing as a centre later in the year, after you have gone through the alphabet once, done a few art projects as a class, etc, and your students are confident and comfortable with taking risks. At that point, it's no problem to send them off on their own. But, in maternelle, I can't recommend it enough - do it together first. Even if I model while using a Sharpie so that everyone can see, the expectation is that my students start with a pencil. This happily usually transfers to be the default when they do drawings on their own, too (like during writing) - it becomes a habit. By starting with a pencil, they learn that if you make a mistake, you can erase it and try again. It builds good habits and makes their drawings look great. I usually do "draw together, colour on your own" - we all draw together at the carpet, one step at a time, and then they put their pencils down. I model how I make colour choices that make sense, and then they go back to their tables to colour on their own. The goal of directed drawing is not to have everyone's work look the same - it is to show our students how to be reflective and think ahead when they are drawing and colouring, and to help them notice that everything they draw is made up of smaller shapes and lines. Our first directed drawings always go with our alphabet! It is important for our students to have as much exposure as possible to the same anchor words for each letter. The objects we draw are the exact same as the objects that are on our alphabet posters. If you don't have alphabet posters or can't find drawing sheets to match what you do have, no problem! You can still use my sheets, and then choose one from each student as you move through the alphabet to make your own posters. I would cut off the top instructions, laminate their drawing, and just stick a cue card or square piece of paper underneath. Write the letter on the square paper or cue card with correct formation, and voilà. Students love seeing their work on the wall, and it is pretty special to have them make the posters you display! Our big directed drawing art projects often go with seasonal or holiday vocabulary I want them to learn, or match up with some of our inquiries. For example, in this post, we did directed drawing dinosaurs as that is what my students were inquiring about. 4. MAKE MISTAKES AND SHOW YOUR STUDENTS THAT IT'S OKAY! I wrote about this in my last post about directed drawing, but I want to touch on it again. Our students need us to model and show them how to behave when we make mistakes. Everyone makes mistakes. All the time! Mistakes mean that you are trying hard, and that you are about to learn something new. Mistakes should be celebrated and encouraged, in our students and in ourselves. Let your students see you make mistakes. Show them what to do if you make a mistake (erase, start over, turn their page over and try again, or let it go). Model out loud what is happening in your head when you mess up and as you decide on a solution. 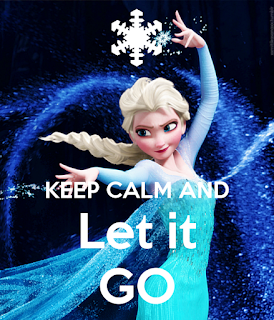 And if you try again, mess up again, and start to feel frustrated... show them how to let it go! I would love to know if you do directed drawing in your classroom! If you do, tag me in some pics on Instagram of your students' work (@mme.andrea). If not, I do have an alphabet directed drawing resource available for purchase on TPT. It matches up with my posters, flash cards, and other alphabet activities. >>> CLICK HERE to check it out!